Our teardrop pallet racks are fabricated at our Southern California location using US steel. As a manufacturer and turnkey solution provider, Pacific Bend Inc., can offer you fully managed pallet rack systems at very affordable prices. Our amazing team of engineers and machinists have found a way to improve the pallet rack design. Through their hard work and determination, a superior pallet rack has been made. 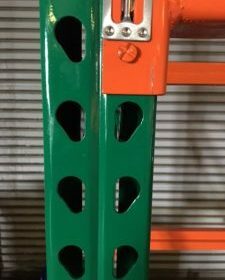 The pallet racks we fabricate can withstand more weight and damage than regular pallet racks. The machines we use to produce our pallet racks are custom built and designed to make the perfect rack. While our machines support the standard pallet rack sizes they can also be adjusted to manufacture your custom pallet rack sizes. Our powder-coated surfaces are highly resistant to chipping, scratching, fading and available in many colors. 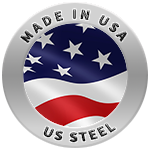 We commonly use 12, 14, or 16 gauge US steel to fabricate our pallet racks but can accommodate customer requirements. Your choice will vary depending on the commodity being stored, its weight, number of bays, levels and local seismic ordinance requirements. Our pallet rack pricing is based on material sizes and the types of services that you select. Our experienced engineers can assist you with the planning and local city permit process in order to determine an optimal configuration for your space. Our team has delivered and installed warehouse racking all over the state of California and all over the nation. There is no job too big for our company. Our team of engineers and project managers can help you design an optimal layout for your warehouse using the latest AutoCAD software. As part of our fully managed pallet rack turnkey solutions, Pacific Bend Inc. offers the following services. If you would like one of our rack engineers to contact you and discuss your needs in more detail. Please provide us with your name and email, we don’t spam.